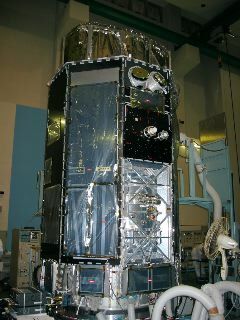 The first integration and test (I&T) of Astro-E2 with flight components was started on July 1, 2003 and finished on November 27, 2003. Even though we make enormous efforts to avoid making problems on the way of designing or creating components, errors or mistakes are always found in this kind of huge complicated system. Those problems have to be found in the early phase, and to be fixed. One of the purposes of the first I&T is to find any such mistakes, through a great number of mechanical and electrical tests. Then, we can make the spacecraft system perfect, and ready for launch. At the end of October, the spacecraft was almost fully assembled (left panel of Photo 1), and performance tests were carried out in a row. In the beginning of November, a performance test for the whole spacecraft and a deployment test of the optical bench of the X-ray telescopes were carried out (right panel of Photo 1). Photo 1: Left: The spacecraft during the final performance test. The duct around the spacecraft is to cool down the subsystems. Right: The spacecraft when the X-ray telescope optical bench was extended. It may be a little difficult to see the difference between the left (before) and right (after) photos because of the support structure around the spacecraft. The spacecraft will be as in the left photo during the launch, and the solar panel and the optical bench of the X-ray telescopes will be extended in orbit. 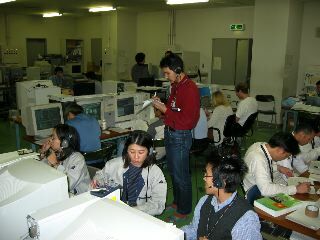 Photo 2: The satellite checkout room during the performance tests. 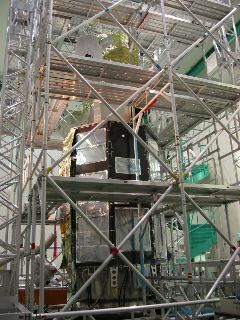 Photo 2 shows a room to check the satellite status during the performance tests. People who take a responsibility for each subsystem are monitoring the present subsystem status. The first I&T has been finished at the end of November, and the spacecraft was taken apart to subsystems. We found some minor problems during the tests. From now on, we will struggle and deal with them while doing some performance tests of each subsystem. All problems will have been fixed by April, 2004, when the final I&T test is scheduled to be started.